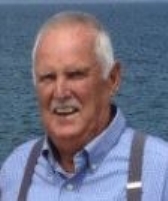 Portland, Maine - Robert (Bob) G Hanscome of Portland, ME passed away June 14, 2017, at home, with his wife, Pam, by his side. He was born August 18, 1934. He attended North Yarmouth Academy Prep School, graduating with a History Scholarship in 1953. In 1959, he completed a four-year machinist apprenticeship program at Bancroft & Martin, South Portland. From 3rd class machinist to lead person, he stayed with them until they closed in 1989. A man who couldn't be idle, he started Hanscome's Christmas Tree Farm at age 55 and was tending trees until his death. He loved meeting and talking to the customers when they came to select & cut their tree. He talked as long as someone would listen. To relax and get away, he & his wife bought a home in Florida where they went part time. They also have a camper at Nason's Beach where they have been going since 1988. He is predeceased by his brother John Hanscome & half-sister Lillian Oliver. He is survived by 3 sisters, Judy Ross, Alice Ray, & Pat Corney. He is also survived by 2 (step) daughters, Lynette Stayte & her husband Mark, Lisa Pease & companion Rick Williams, 7 grandchildren, Joshua, Rusty, Casey, Wyatt, Shaun, Marika & Keith, 4 great grandchildren, and numerous nieces and nephews. Family was everything to Bob, not a day went by that he didn't talk proudly about one of them. He was a caring man who was always willing to listen, ready to lend a hand. His intelligence, kindness, and work ethic touched all. He may no longer be here on earth, but his influence, teachings, and thoughtfulness will always be our guiding light. An important part of many lives, he will be deeply missed and forever in our hearts. Relatives and friends are invited to a memorial on Monday, June 19, 2017 at 6:00 p.m. at Hanscome’s Christmas Tree Farm, 194 Mountfort Road North Yarmouth.